New Years is synonymous with a number of cliches. The notion that New Year’s eve party attendees must have someone to kiss at midnight is one, but the adage that gets picked apart most is the tradition of setting a New Year’s resolution. Gyms capitalize on the countless people that sign up for memberships in hopes of bettering themselves only to stop showing up by February. As an automaker that likes to be realistic, Honda realized that most midsize truck owners are much like those New Year’s goal setters. During a fit of inspiration, they envision their lives full of the types of activities that require a truck, but once they drive off the dealership lot, they spend 95% of their time stuck in traffic on the way to work, dropping the kids off at school, and hitting the grocery store on the weekends. 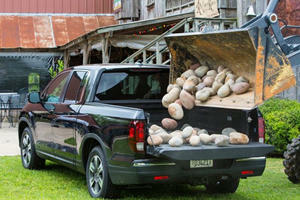 To mitigate the fact that, while they can pull these chores off, trucks aren’t well suited to a life of duty in the suburbs, Honda built the Ridgeline, a pickup that uses creative alterations to the standard truck recipe to provide a vehicle with all the utility a pickup needs without the downsides. Its first generation didn’t sell in absurdly high numbers, but then again, neither did its competitors. However, with the midsize truck segment heating up, Honda felt that it was justified in revamping the Ridgeline and thankfully the product planners decided to stick to the original recipe that made the first one so great. 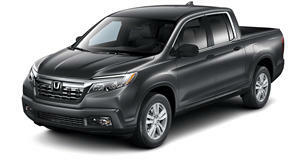 While $29,475 will get you every crucial piece of Ridgeline equipment as standard, Honda went ahead and sent me the top trim Black Edition loaded with such niceties as Honda Sensing, the automaker’s suite of semi-autonomous driver aids, heated front seats and steering wheel, tri-zone climate control, and state of the art bed speakers that vibrate the actual bed liner to create crisp sound for any tailgate. Red stitching, black leather, and a blacked out color scheme came with the package resulting in a $43,770 sticker price. I’ll reiterate though, none of that is necessary to get the full Ridgeline experience. At base price, the same 3.5-liter V6 is available supplying 280 horsepower and 262 lb-ft of torque through the same six-speed automatic, affording a brisk 6.6 second rush from 0-60 mph in our AWD model. Front-wheel drive can be had, also a truck first, but it only supplies a 3,500 towing capacity and forgoes Intelligent Traction Management, Honda’s off-road program. An extra $1,800 buys the all-wheel drive system and raises the towing capacity to 5,000 pounds. This figure is still dwarfed by the Ridgeline’s competitors but if you need to haul more than that, you’re better off with a full-size truck. Mileage drops with the AWD system, but the 21 mpg (18 city, 25 highway) is comparable to most of its competitors’ four-cylinder models despite the fact that we averaged 14 mpg in dense city traffic. Spec’d or not, the Ridgeline gleams from the get-go because its shining quality, the single piece of hardware that alludes to its design philosophy, is available at base price. That would be the unibody chassis, an arrangement that starkly contrasts with the body-on-frame construction of literally any other pickup truck on the market. Truck lovers may decry the Ridgeline as a phony because of it, just as drag strip purists hated when the Mustang switched to an independent rear suspension, but the payoffs reach far and wide. The results are immediately perceptible, with the Ridgeline feeling like a large sedan on the road and delivering a ride that removes all anxiety from rush hour traffic and belies its 4,420 pound curb weight. The electric steering is direct and skews towards being a bit light, but the culmination of the package feels just like any other Honda: solid as rock, ready for whatever, and featuring no standout characteristic to dazzle the senses with. That might not bode well for the enthusiast, but in a truck, that enduring compatibility with anything that comes its way is exactly what's needed. Further proof of this philosophy is found in the bed liner, which is made out of a composite that is neither punctured nor dented when dropping a toolbox on it. 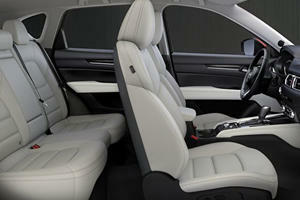 This time around Honda removed the awkward curved bed that appeared to merge into the C-pillars. The trade off is an indecisive design where the front end looks like a Honda Pilot that’s had its rear end abruptly cut off and replaced by a bed, but bear in mind that utility reigns over aesthetics here. One of our favorite features was the "trunk" embedded in the bed. The compartment, which solves the problem truck owners have when trying to store items in the back without risking getting them stolen or wet in the rain, is afforded by the fact that Honda broke another truck rule: forgoing a solid rear axle in favor of an independent rear. This makes room for 7 cubic feet of storage space that can double as an ice chest thanks to a drain plug at the bottom. Accessing it is easy since the tailgate can either drop down like on any other truck or open sideways like a car door, eliminating the need to climb into the bed to reach for objects an arms length away. Supplied with what is essentially the perfect tailgating truck, we set out to test the Ridgeline the only way we saw fit: by hosting the CarBuzz holiday party out of its bed. A Christmas tree purchase and borrowed TV later and we found ourselves dining on the finest deli foods that a grocery store could offer. The bed speakers played Christmas carols while the TV, which was plugged into the 115-400 volt bed outlet, displayed a mock fireplace intended to act as a placebo to help us feel warm. After getting our fill and provoking countless smiles and thumbs-up from onlookers, we packed up, placing our belongings in the 1,499 pound payload capable bed and in the rear of the cab since, when the rear seats aren't supplying healthy amounts of leg room, they can be lifted to stow even more gear. It was once friends and co-workers had seen all of these clever Ridgeline features that I realized what the truck’s defining characteristic was, and no, it had nothing to do with the unibody chassis. It was the fact that everybody liked the Ridgeline, especially when it was enlisted to make a beer run for another holiday party. Fun fact: the storage compartment in the center console, which, like the rest of the interior, is lifted right out of the Honda Pilot, fits a six pack perfectly while the rear storage trunk can swallow an entire keg. Coincidence? You tell us, Honda. Like nearly every other Honda, the package comes together in a manner that shows that the engineers and product planners were thinking about the city-bound truck buyer by merging crossover capability into the body of a truck. One imperfection I could note was the placement of the jack and spare tire inside the rear storage compartment, meaning those with fully loaded beds would need to unload cargo to change a flat. Then there was the sluggish touchscreen infotainment system that lacked a physical volume knob and instead relied on a touch-sensitive slider. 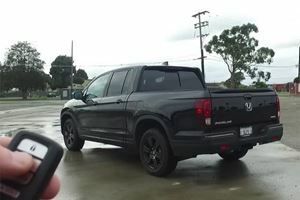 For those who subscribe to the ironic notion that a truck determines your manhood (since, you know, REAL men use fashion statements to identify themselves instead of being confident in who they are), then the Honda Ridgeline isn’t for you. But for those that have all of their needs met by what a mid-sized truck can deliver and still need to navigate heavy traffic to get to work, then the Ridgeline is the smart buy. Even if it isn’t the conventional truck, it’ll spark a hint of envy at the tailgate and best of all, in typical Honda fashion, it will inspire a deep sense of satisfaction a hundred thousand miles down the line. Not everyone needs a pickup that can tow 8,000 pounds. Not everyone needs a true 4x4. Noise, vibration, and harshness are the enemies of luxury, and lack of comfort is one good way to let your competitors win.